Epicoccum is a sooty mold that is especially prevelent in cool and moist weather conditions. 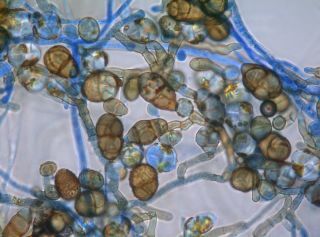 Epicoccum mold is common in soil and food. It is the usual cause of leaf spots on plants. The only species in the Epicoccum genus is Epicoccum purpurascens. People often develop allergies to molds of this species. The image of epicoccum mold is though a microscope at 400X magnification. Thanks to www.enius.de for the image.